This time last year, during the Television Critics Association winter press tour, Scream Queens was renewed for season two on FOX. While no renewal was announced this time around, there may be some hope yet for the comedy horror series. Emma Roberts, Jamie Lee Curtis, Lea Michele, Abigail Breslin, Keke Palmer, and Billie Lourd star. Now, Deadline reports that although FOX entertainment president David Madden acknowledged its problematic linear ratings, he stressed the show’s “solid multi-platform performance.” That Scream Queens attracts “the elusive young audience,” is a factor working in its favor. In season two, Scream Queens averaged a 0.60 in the 18-49 year old viewer ratings demo. In addition, it drew an average total audience of only 1.446 million viewers. Currently, we are tracking the ratings for 19 scripted FOX series in the 2016-17 television season. Those ratings land Scream Queens near or at the bottom of FOX’s slate, whether sorting by the demo rating or the total viewership. On the other hand, Scream Queens season one averaged a 1.09 rating in the 18-49 demographic and drew about 2.79 million total viewers. After just two seasons, almost half the audience seems to have abandoned the show. What do you think? Are you a fan of this TV show? 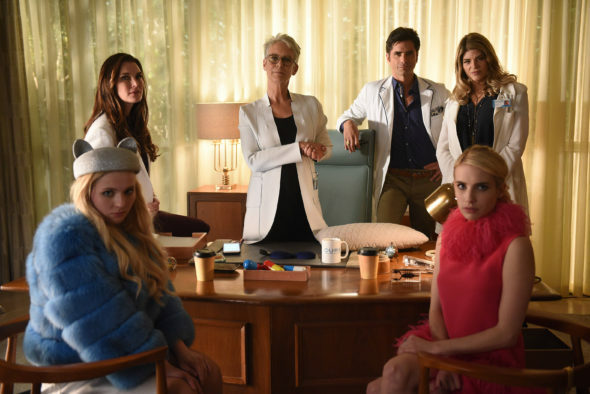 Should FOX cancel or renew Scream Queens for season three? Sound off, in the comments. I am a big fan of the 1st season but unfortunately the 2nd is crap. It’s time to call it quits… I’m very confused about all these articles about FOX series claiming they’re ‘not cancelled’, but they’re ‘not renewed’ either… So are they in limbo?